Planning a wedding is a very delicate and complicated process with thousands of moving parts that must come together harmoniously in order to make your dream wedding a reality. Here’s some advice that will help keep you sane and make all the pieces come together the right way for your big day. When looking for the perfect venue, you have to keep in mind the amount of guests who will be invited. It is extremely important that there’s plentiful space for your guests and crew. Remember that aside from guests, there will be tables, waiters, musicians, etc. If your Wedding falls on the same date as a big local, this could cause some problems with traffic or hotel availability for those who are coming from out of town. Be sure to talk to your wedding planner and ask for about special venue prices. Usually, Friday and Sunday weddings can cost about 30 percent less than a Saturday. If you’re doing a summer wedding, the heat could become an issue. Think ahead of what the temperature will be and make sure that your guests are comfortable. If you’re doing an outdoor wedding in the heat, some guests will surely leave early. It’s also recommendable that you have a contingency plan in case some unexpected rain decides to show up! If you’re going over budget, the easiest way to save some money is by cutting the guest list. The biggest chunk of expenses will come from feeding and providing drinks for your guests. Remember that it’s customary to also feed your wedding vendors, which includes your wedding planner, photographer, videographer, and DJ or band, plus their assistants. When you hire the wedding band, make sure you pick the right package for you and your guests. You wouldn’t want the band to start playing at 7pm and leaving at 10pm when the party is just getting good and guests are up and dancing. Make sure you sign a band understand what you want and exactly what is expected of them! Do not throw away receipts, meeting notes, or correspondence with vendors. Open an email account specifically for your wedding to help you be organized. Nobody likes having to wait for drinks. It’s important you have the right amount of bartenders to guests to keep the line at a minimum. It usually takes 1 bartender per 50 guests, but if you’re serving more complex drinks, you should consider having an extra or two. Your wedding planner will be your main pillar of support, and as your most-trusted expert during the planning process, you should feel free to discuss specifics and exchange ideas. 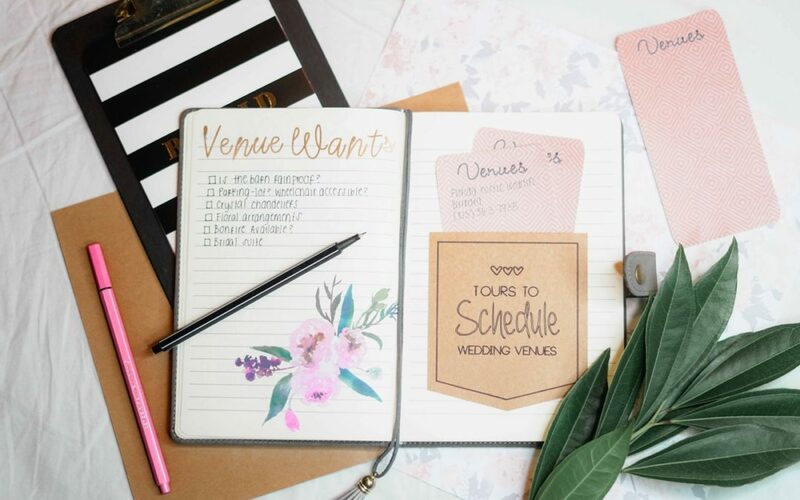 At the end of the day, you should feel confortable with your wedding planner and be able to have conversation with them about what it is you want. Their job will be to tell you what you can and can’t make work based on your budget. Make sure guests know where they need to be and how to get there efficiently. Remember that some addresses are a little too complex for the GPS to provide accurate directions. Ask your ceremony and reception sites for printouts or digital copies of recommended driving directions and even test out the routes yourself. Add this map to your website for easy access!